It’s been over half a decade since Gorillaz last toured, but in that time their mythos has only grown, and on returning with Humanz this year, Damon Albarn proved that he still has the power to call up just about anyone in the current musical landscape and get them to drop a feature on his record. Even more impressive is that he has managed to cajole a lot of them into coming on tour with them, to perform their guest spots live to crowds probably a lot more sizeable than they’d be doing at their own headline shows. 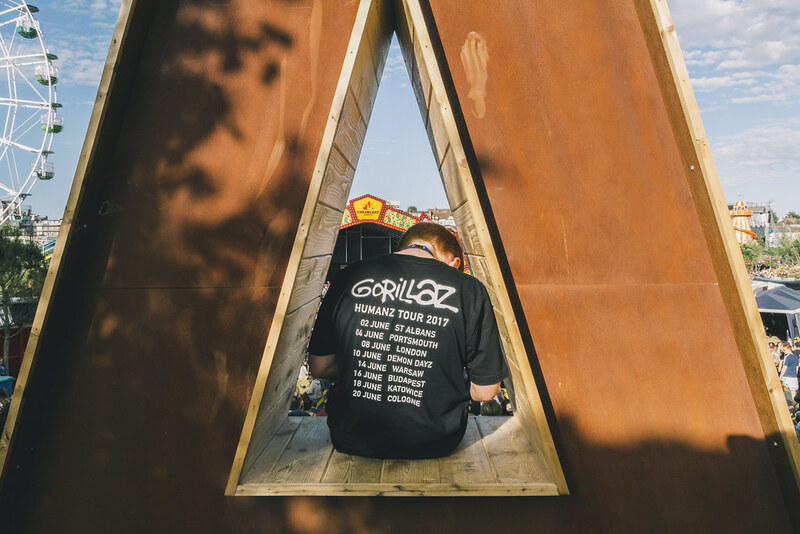 The main event in Gorillaz current short run of guest-bolstered performances was their Demon Dayz performance; a one-day festival where the lineup more or less featured everyone that appears on Humanz. 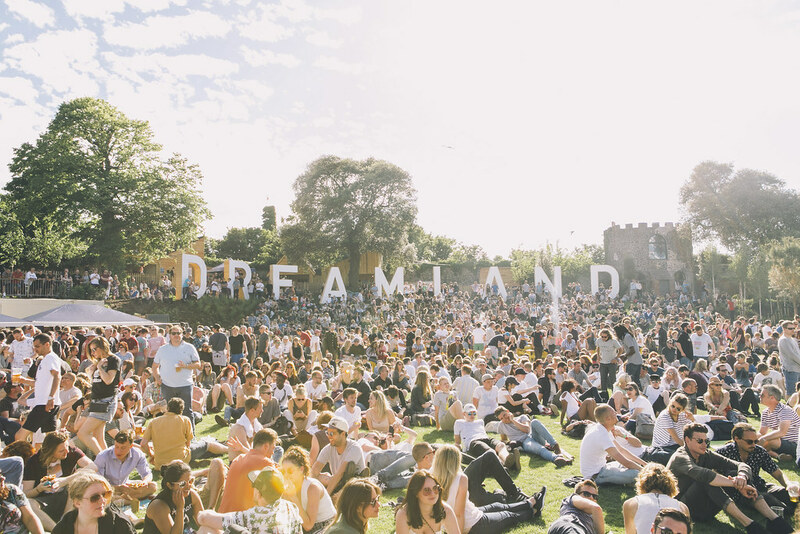 The festival took place at Dreamland in Margate, not the most typical of markets, but a venue that has become quite popular since its refurbishment and reopening in the last few years. And it was the perfect venue for a Gorillaz themed day; amidst helter-skelters, tombolas and hooded figures wandering the grounds ominously, you could easily imagine 2D, Murdoc, Noodle and co. running around amidst the merry making public. Although there were multiple stages on the day, I remained at the main stage for the entirety, in order to get a best-placed view when the headliners arrived. I was frustrated not to have the opportunity to witness Kilo Kish, Little Simz or Danny Brown tearing up the Hall By The Sea stage, but I knew that I would get a chance to see them all later during the main event. The first act on the mainstage that I saw was hip-hop legends De La Soul, who have now appeared on all of Gorillaz last three albums. 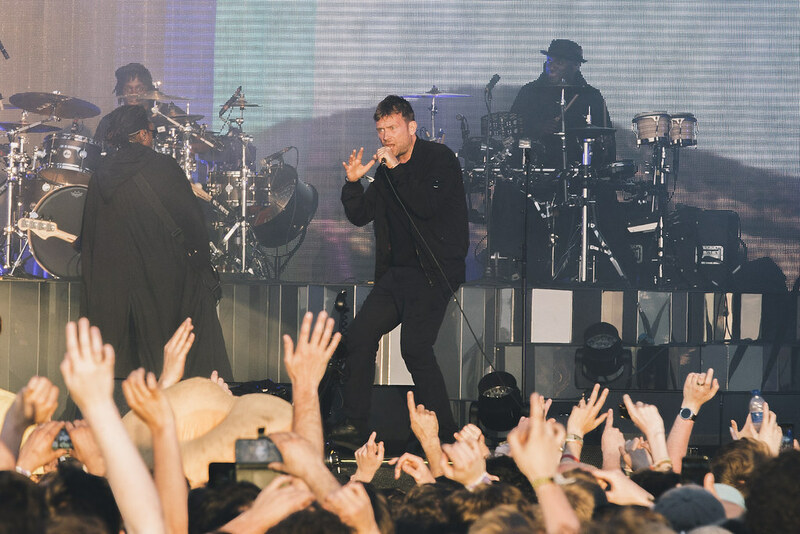 They seem to be tight with Albarn, as they did him a solid here by performing in the middle of the afternoon, when it was scorching hot, but putting plenty of energy into their role as hype men for the evening. While they did drop some cuts from their albums, it seemed like the majority of their set was spent whipping up the crowd, making them compete to see which half could be the loudest (“party over here,” “no, party over here”). It might have become quickly tiresome to some lesser experienced acts, but with De La having been around for over two decades and played countless festivals in that time, they seemed completely at home. And when they finished with ‘Me, Myself and I’ it was clear that their work had paid off, with the majority of the crowd singing along to its indelible chorus. 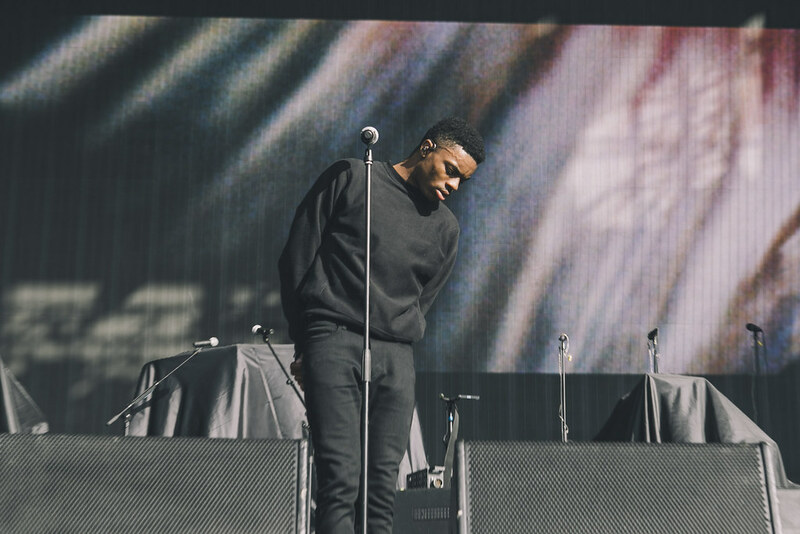 Next up on the main stage was Vince Staples, in whom Gorillaz evidently have plenty of belief and excitement. Not only did they place him higher up the bill than bonafide legends De La Soul, but he is also used as the fuel injection at the opening of Humanz, coming flying out of the gate on opening track ‘Ascension’. For his own set, Staples was dressed entirely in black, which must have been sweltering in the weather, but added to the seriousness and toughness that resounded from his performance. With a new album Big Fish Theory just a couple of weeks away from release, this was a good opportunity to win over a slew of new fans, and he seemed to know it. 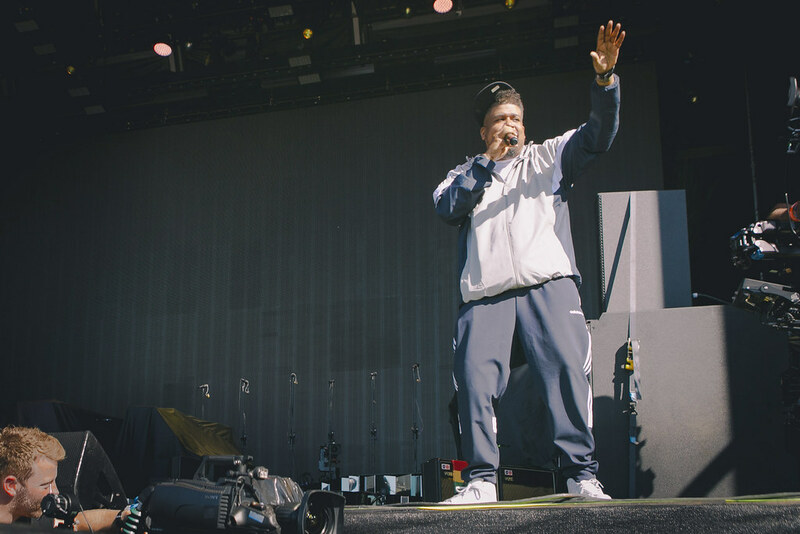 He started confidently with the cult favourite EP cut ‘Blue Suede’, before moving into a set largely consisting of bangers from his last full-length Summertime 06. In terms of new tracks he only performed those previously released, ‘Big Fish’ and ‘BagBak’, but both went down a treat. The only questionable choices in his set were the decision to include ‘Lemme Know’, which is a great song but fell a little flat on the day, and when he had ‘War Ready’ waiting in the wings unused it was a little frustrating (especially as the beat had been teased before his appearance on stage). It would also have been nice to have seen a duet with Kilo Kish, since she was at the festival and put in a number of crucial features on some of those Summertime 06 tracks, but they probably didn’t have time to prepare it. Overall Staples’ set would have been a winner for those both familiar and unfamiliar with his work; ‘Jump Off The Roof’, ‘Señorita’, ‘Norf Norf’ and others all left their intended mark on the crowd. Billed as the ‘special guest’ before Gorillaz headline set, East London rapper Kano was the final warm up act on the mainstage. Admittedly, a large proportion of the crowd had made their way across to see Danny Brown at the Hall By The Sea at this point (and my mind was wandering over there too), but those who stayed were treated to a lively and inspiring summer evening set from the established rapper. The first act of the day to have live instruments on stage made good use of the extra dynamics these elements provided, and got the crowd moving along to cuts from his most recent release. However, the biggest cheers of his set came when he dug into his back catalogue and unleashed some of his grime roots. No matter what the backing he was rapping along to, Kano’s flow never wavered, just as his smile never faded, and he eased us professionally into the main event of the evening. 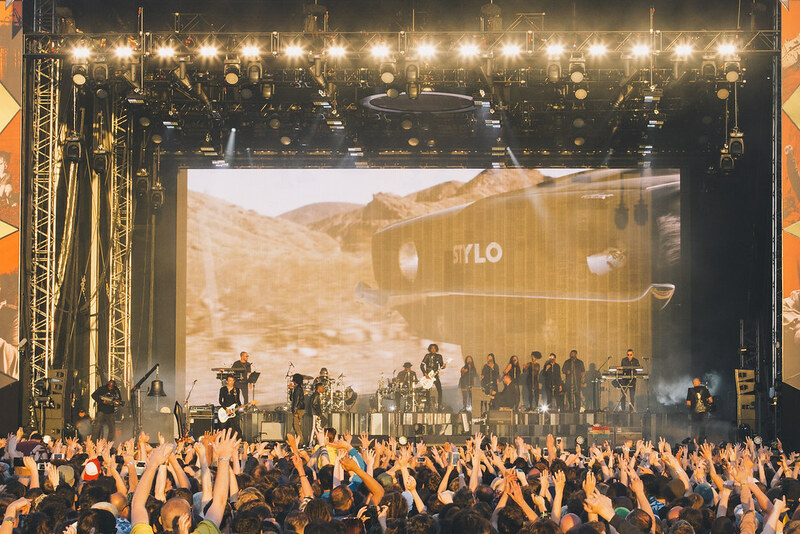 The first people onstage for Gorillaz headline set were the supporting cast of singers and musicians, arriving in single file – dressed as the hooded figures that we had seen wandering like a black cloud through the bright carnival all day. They removed their hoods and got ready to perform as Albarn arrived onstage to tremendous applause. Once everyone was poised, we were launched into ‘Ascension’, with Vince Staples re-appearing in a slightly more relaxed outfit (including glasses), but with no less vigour as he provoked the crowd into their first all-out dance fit of the evening. The band shortly followed that up with a cut from their back catalogue, ‘Last Living Souls’, whose pulsating rhythm kept the momentum up and the crowd’s legs springy. The second guest of the evening came in the form of Popcaan who loquaciously guided the crowd in a tropically-tinged singalong. Peven Everett appeared next to do a very good facsimile performance of Bobby Womack’s part on ‘Stylo’, which expanded magnificently into the audience, and with another pair of older cuts, ‘Tomorrow Comes Today’ and ‘Rhinestone Eyes’ following up, Gorillaz had firmly re-established themselves as colossal festival headliners. ‘Rhinestone Eyes’ in particular showed off the full extent of their populist potential with the entire crowd bouncing and chanting along wordlessly with the anthemic synth melody. With the crowd now firmly under their control, Albarn guided his troupe through a slew of songs from Humanz. ‘Momentz’, with the live inclusion of De La Soul’s energy, exploded in a way that it never quite manages on record. One of the album’s highlights ‘Submission’ stood up even stronger in the live setting, with a surprise guest appearance from Kelela (she wasn’t on the bill for the festival, so I hadn’t expected her to be there), and Danny Brown swanning onto the stage to coolly and confidently deliver his verse. His assuredness and brazen flow made me both satisfied that I had witnessed him perform so brilliantly, and all the more frustrated that I had missed his solo set. The crowd’s patience with the new songs (though they lapped up every second) was repaid with the double header of Demon Days favourites ‘El Mañana’ and ‘Dirty Harry’. The former was perfect in the golden sunset, the Spanish guitar and forlorn visuals matching the mood perfectly and giving everyone a relative breather. This was immediately blown away by the introduction of ‘Dirty Harry’, with everyone singing along to the earworm melody. Kelela made another surprise appearance to bolster the melancholy ‘Busted and Blue’, adding atmospheric vocals in her angelic voice, wringing out the emotion from Albarn’s lead vocals. Returning to the old favourites, ‘Kids With Guns’ got the crowd robotically singing along to the song, which seems even more pointed today than it did when it was released. Then Albarn had dug up Shaun Ryder from somewhere to come out and perform ‘Dare’, looking as if he was having the time of his life leading the entirety of the crowd in this festival favourite. ’We Got The Power’ is a bit of a flub of a final song on Humanz in this writer’s opinion, but as the main set closer on this occasion its message of change and unity rang true. This was helped by the guests; Damon’s old Blur buddy Graham Coxon came out to join in, but the focal point was the ever fierce Jehnny Beth, leading the vocals. Although she was only on for a few minutes, she was in full-on Savages mode throughout; dressed in an all-white suit she was unmissable, moving straight to the barrier and then standing on the crowd to deliver her lead vocal. This could easily have been the end of the night, but Albarn has a good sense for the theatrical, so the final couplet of ‘Don’t Get Lost In Heaven’ and ‘Demon Days’ culminated all the excitement and emotion of the event into a musical triumph. The crowd was left in no doubt that they had witnessed a spectacle, and comparing notes on the way home, it surely would have been tough for anyone to have picked a highlight. From visuals, to guests, to musicians, to the songs themselves, Gorillaz put on the audio-visual treat that everyone going to see a star-studded fictional band would want to see.